In Kas (it means Eye Brow in Turkish) the traces of the Lycian civilizition are visible even today, desbite numerous modern buildings have been built here. Small houses with exquisite windows and Bouganvilles cluster only the town’s narrow streets, but all the same, Kas remains as one of the most untouched Mediterranean ports. A small amphitheater to the west of Kas, which is located right acroos the Greek Island of meis (Kastellorizon) and the Lycian tomb in uzun carsi are the most important symbols of the Kas’s passionate embrace of its historic past. 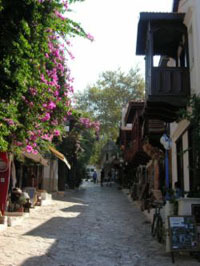 In addition to the the archaeological riches in the surrounding area, Kas itself is an ancient place of value. Habesos, a name given to its many hotels, is the oldest name of this ancient city. Hoeover, the city was also called Antiphellos. Situated at the crossroads connecting the ancient regions of Caria and Lycia, Antiphellos, was also a trading port. During the Anatolian campaign of Alexander the great, Kas came under his rule, but after Alexander the great died, the regionwas ruled by the Seleucids and later by Ptolemies dynasties. 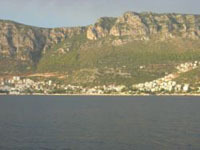 The most notewortly historic sites in the ancient city, which played a significant role in the Roman period and became the episcopal center in the Byzantine Era, are the tombs carved in the rocks in the north of the city and the Lycian mausoleum is the 4th cebtury Lycian Mausoleum, which is known as the King’s Mausoleum among the public and is in the Uzuncarsi Street today. The ancient amphetheater of Kas is one of the most important historic works of art in ancient Antiphellos. Dating from 1st century B.C. the theater has a seating capacity of 4000, and it is the only theater in Anatolia that faces the sea. Having the most divergent geography in the Mediterranean region, Kas was built in a bay on a peninsula that extends to the sea in curves, on rocks and on the slopes of steep mountains. Thus, all boardinghouses in Kas can be reached only through climbing high stairs. there are no beaches in the center of Kas as it is built on rocks, but you can use the Kucuk and Buyuk Cakil (Small and big Pebble) beaches in the western quarter of the peninsula. Kucuk Cakil is near the town center and is arranged in the form of a sea park, whereas Buyuk Cakil is a public beach located in a calm and modest cove. Another beach is Limanagzi, which you can reach by boats that set out to sea from the port. Howover, Kaputas beach is the most popular beach in Kas and Kalkan. You must descent 192 steps in order to reach the beach that is inside a deep curve of rocks located 19 km from Kas, but it is worth seeingbecause this place is a heaven on earth with its turquoise blue waters and golden sand. Moreover, yoo can also go on a boat cruise if you are Iooking for an alternative way of spending your time. The Kekova Tour that includes rests in Yaglica , Inonu Cove and the Aquarium Cove is just the right thing to do. You can visit Kekova, which has the richest shipwrecks and sunken cities in Turkey and go scuba diving by participating in tours during which you will follow the coast line and than stop by Simena, Uc Agiz and the Sunken City. The most attractive sea cave in Kas and the surrounding area is the Sea Cave of Asirli island. The port, marketplace, buildings, restaurants, boutiques, cafes, and shops in Kas have a bohemian touch… Perhaps that’s why visitors Kas as well as its residents who have left big cities and hood refuge here are usuaily intelectuals. In Kas, listening to street musicians while strolling thrugh Uzun Carsi. Kas offers opportunitues for all types of water sports as well as paragliding, hikes in nature, and boat cruises. Plateau tourism is also a rising trend. he ruins of the ancient city of Antiphellos can be seen in the Felen Plateau, located at 12 km to Kas.